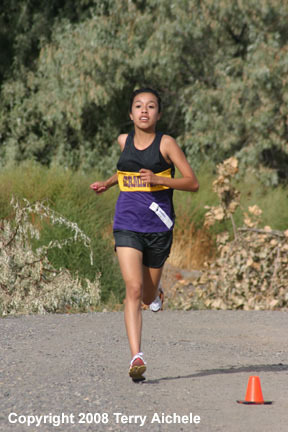 HERMISTON- Cristal Delgado, a senior from Hermiston, won the girls cross country race at the Hermiston Invitational at Sandstone Middle School in Hermiston, Oregon with a time of 20:15.7. It was a very hot day with temperatures in the high 80's. 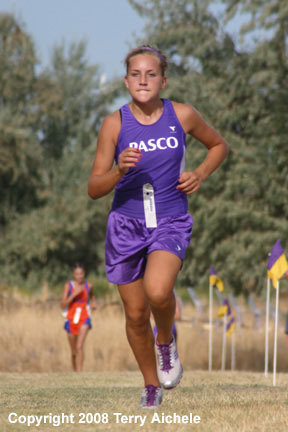 Marisa Vander Malle, a junior from Pasco, came in second with a time 20:39.7. Third place went to senior Nancy Cardenas of Umatilla, 4. Janette Rodriguez from Pasco, 5. Kimberly Macias from Hermiston, 6. Kelsey Trotter from Hermiston, 7. Katharine lotze from Kiona Benton, 8. Jadie Wick from Hermiston, 9. Cynthia Ascencio from Hermiston and 10. Elise St. Hilaire from Hermiston. LEFT - The racers about 100 M into the race. On the far right is Cristal Delgado from Hermiston and just to the left of her is Nancy Cardenas of Umatilla. RIGHT - Just about 40 M later Delgado and Cardenas take an early lead in the varsity girls cross country race. LEFT - Cristal Delgado comes down the hill from the loop around the Field of Dreams baseball complex. 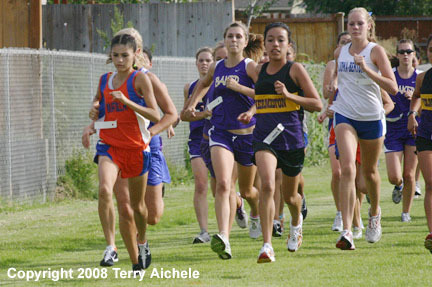 RIGHT - Nancy Cardenas of Umatilla leads two Pasco runners after making the Field of Dreams loop. LEFT - A group of runners from Baker, Kiona Benton, and Hermiston, run down the hill after making the circuit of the Field of Dreams. RIGHT - A Umatilla runner shows the toll the heat took on the second lap of the cross country circuit at Sandstone Middle School on Friday. 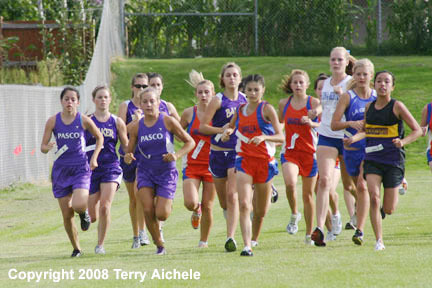 LEFT - Marisa Vander Malle from Pasco nears the grove during the cross country race on Friday. 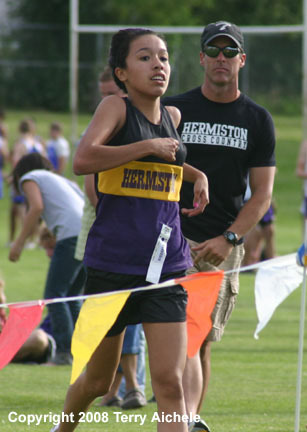 RIGHT - Hermiston's Cristal Delgado nears the finish line with a time of 20:15.7. 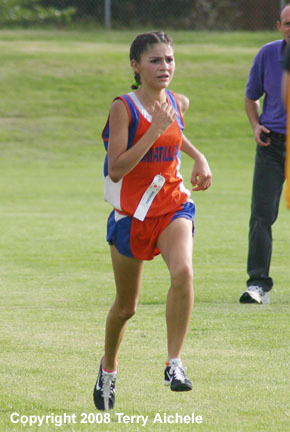 Nancy Cardenas, a senior from Umatilla sprints for the finish line on Friday afternoon. 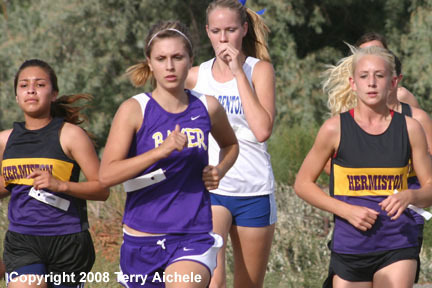 When asked if it seems like a long journey from her first race as a freshman she replied, "Time has gone by fast." She is amazed that she is already a senior.